Now that SageTV has added the new SystemMessage functionality with their latest beta release, the SageTweet plugin becomes even more useful. The developer of SageTweet has built in support for the new system messages and I’ve been trying it out. This SageTV Twitter app is not meant to “twitter” from your HTPC – it’s more of a twitter messaging system and really quite useful. This latest build adds the ability to tweet these system messages. So how might you use such an add-on? If you have a “main” twitter account that you use for normal twitter purposes, add your HTPC twitter account as a friend so you can see the updates from it. If you have SageTweet set up for critical updates only you might be interested in adding SMS alerts (enable device notifications on the twitter account.) That way you’ll get a text message when something goes wrong on your SageTV recordings for instance. A quick, to-the-point text message warning you that a tuner isn’t working for instance can be very helpful. If you don’t want to share your HTPC info to the world, check the “protect my updates” for that twitter account. If in the rare occasion you want to share with your twitter friends what you’re watching you can “re-tweet” that message. That way you’re not “spamming” them with every single show, movie and song viewed on your HTPC. 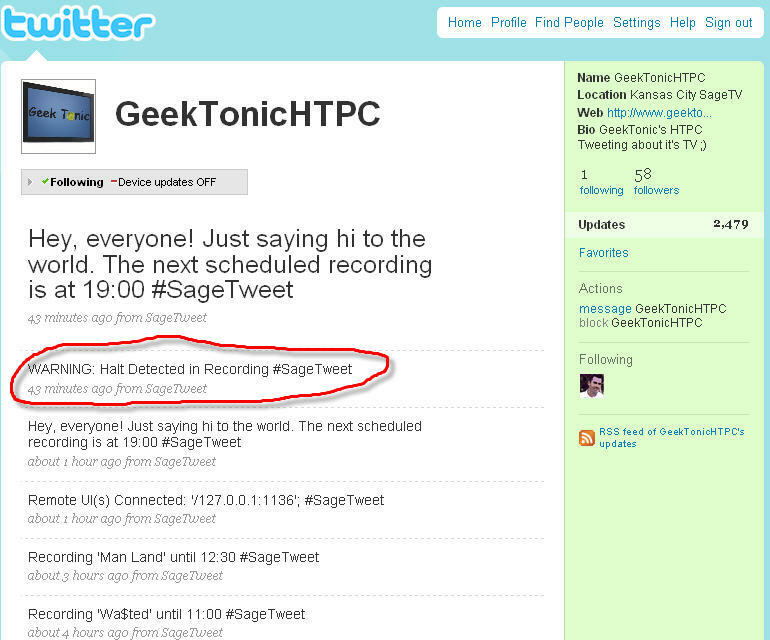 The SageTweets settings page (accessible in a web browser) looks like this screenshot below. Note the “tweet all system messages” added to this version. Quick details on the updates to SageTweets can be found here. Download from here.